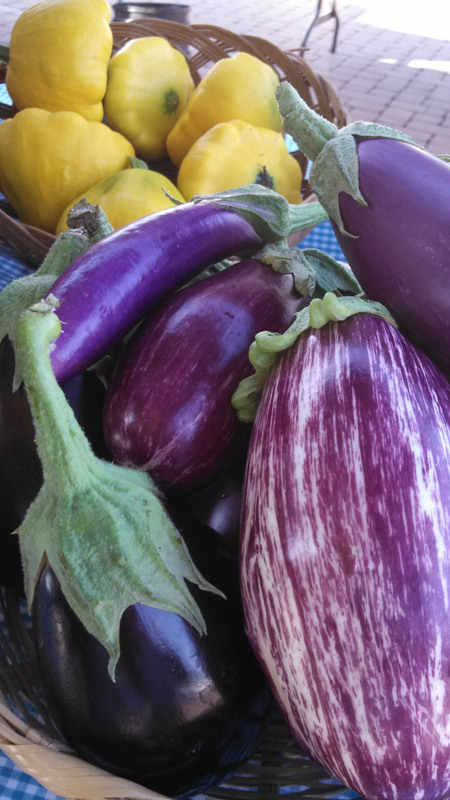 Eggplant and squash from the Country Gals. The Thursday market runs tonight and next week. Come down and see us for our last 2 evening markets. Our Saturday market runs to the end of October. Many of our farmers are busy with fall crops to keep fresh produce available to you. And we still have new vendors arriving with seasonal produce. Thursday expect to find beef, vegetables, breads, baked goods and pecans. We have a new farmer joining us tonight with fresh potatoes. Come get some for dinner! Our market member, Longfellow’s Garden Center, will be having a fall festival this weekend at their Garden Center. Be sure to visit them in Centertown for specials and workshops on fall planting (after you come to the market, of course). There will also be pork, beef, chicken, eggs, pasta, gluten-free baked goods, cookies, fudge, caramels, jam and pie. Cut flowers made their debut last week. Get some local beauty to go along with all that fresh produce. Produce will include heirloom tomatoes, sweet and hot peppers, cantaloupes, onions, cucumbers, okra, squash, potatoes, corn, watermelon, beans and much more. If this week is anything like last week, there should be tons of tomatoes. By LU Market Manager in Uncategorized on August 22, 2013 .